I love all things pumpkin. During the fall it is a must have but I like it so much we have pumpkin flavored things all year long. Bake at 350 degrees in a greased cooking sheet for 20-25 min. It is tasty plain or with a light glaze on the top. Can you tell me how many oz in a reg sized can of pumpkin? I have frozen pumpkin puree and will use that instead. Also, I don't have a high-rimmed baking sheet so will prob halve the recipe and use an 9x13 pan instead. Think that would work? I bet some pumkin pie spice would be a nice addition as well. Um yum! You're making me hungry!! That looks delicious! How perfect for fall! I'd like to invite you to link up at my Friday Favorites party! @ Kim - I use a 15 oz can of pumpkin. I think it would work just fine as a regular cake but you may need to bake it longer. How do you make the glaze? Thanks. I eyeball the glaze and don't really use a recipe. I mix a little melted butter, even less milk and enough powdered sugar until I get the consistency I want. I put a few drops of vanilla in to taste. Yummy! 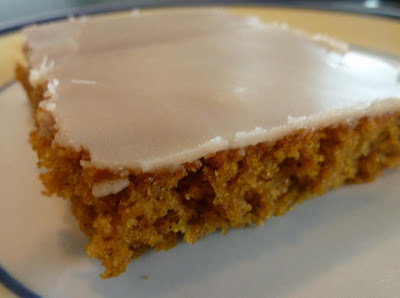 I love all the pumpkin recipes that I have seen lately! Thanks for linking this up at Show & Share! Made this yesterday & it is super yummy! Thank you!